Those include adding Okinawa’s style of karate to the United Nations Educational, Scientific and Cultural Organization’s Intangible Cultural Heritage list, making the international tournament a regular event, having a karate competitor from the southern island prefecture win an Olympic gold medal, and developing karate-linked tourism resources. The prefectural government is planning to draw up a road map within fiscal 2018 to realize the vision, which was unveiled in late April. Still, while hopes are high, there are as many challenges as there are opportunities. To that end, Miyagi, 78, said it is necessary to broaden the fan base for Okinawa’s style of karate by presenting demonstrations at festivals and cultural events in various parts of the prefecture. Okinawa is said to be the place where karate originated. 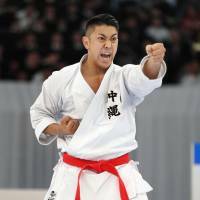 However, there are some differences between Okinawa karate and the karate practiced in many places outside the region. The Okinawan style is considered primarily an art of self-defense, and has given much weight to mastering kata(preset forms), rather than kumite (fighting). Traditionally, it is regarded more as a lifestyle, not a sport. Challenges cited by people involved in designing the “Okinawa Karate Promotion Vision” include a lack of communication between different schools or styles of karate, inadequate preparedness in the prefecture to receive karate practitioners from abroad, too little assistance at dojos, and limited efforts toward the co-existence and mutual prosperity of traditional karate and competition karate. As of April 23, 1,202 people from about 40 countries had already applied to the competition during the first international tournament which will run for eight days from Aug. 1. Of the total, 566 were from outside Japan. Choko Kiyuna, 78, who is chair of the board of directors of the Okinawa Dento Karatedo Shinkokai, which will co-host the tournament, praised the formulation of the vision as a “great deal of progress” that could not have been created by karate practitioners alone.